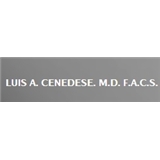 Luis Cenedese, MD (New York) - Book Appointment Online! Welcome to the office of Dr. Luis A. Cenedese, New York Plastic Surgeon, and Institute Beaute des Arts, your source for cosmetic surgery services in Midtown Manhattan, New York.The Office of Dr. Cenedese, and Beaute des Arts, is conveniently located in the heart of Manhattan, New York along the Southern side of New York’s Central Park. 30 Central Park South (also known as 59th Street) is situated between Fifth and Sixth Avenues, and is a short walking distance from The Plaza Hotel, and The Apple Store on Fifth Avenue. If you are taking the subway, the most convenient station stop is “Fifth Avenue” on the N, Q and R lines.NOTE: WEEKEND APPOINTMENTS MUST BE SCHEDULED AT LEAST 12 HOURS IN ADVANCE. Please check our website, www.drcenedese.com for our cancellation policy. Great doctor. Explained all options, very up front, very attentive. Would definitely recommend.